Bros. Pictures’ Batman v Superman: Dawn of Justice opened with a record-setting $36 million on 945 IMAX screens globally — the widest-ever day-and-date debut for an IMAX release — resulting in the best-ever worldwide launch for a film outside the summer and Christmas play periods, as well as the highest opening for a March release, surpassing Alice in Wonderland (with $15.3 million). Overall, Batman v Superman now stands as the third-largest global opening for IMAX behind Star Wars: The Force Awakens — which earned $47.5 million during opening weekend — and Jurassic World (with $44.1 million). Domestically, Batman v Superman: Dawn of Justice also saw the highest IMAX opening in March, with $18 million on 388 IMAX screens, which translates into a powerful $46,000 per-screen average. The film kicked off the domestic weekend with particularly strong presales, continuing that momentum with sellouts throughout the weekend. International IMAX weekend results for Batman v Superman reached a benchmark $18 million (also a March record) on 557 IMAX screens, including China, where IMAX contributed an estimated $7 million on 272 screens. Other markets that saw notable results include: France, the U.K., the Netherlands, Brazil, Ecuador, Australia, Hong Kong and the United Arab Emirates. 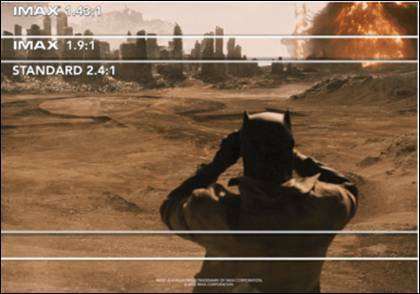 Director Zack Snyder captured several sequences of Batman v. Superman: Dawn of Justice with IMAX’s extremely high-resolution cameras. As a result of this, only in IMAX® theatres do sequences filmed with IMAX cameras expand vertically to fill the entire screen, delivering IMAX audiences greater scope and breathtaking image quality. The IMAX® release of Batman v Superman: Dawn of Justice was shown in its digitally re-mastered format, which includes the image and sound quality of The IMAX Experience® with proprietary IMAX DMR® (Digital Re-mastering) technology. The crystal-clear images, coupled with IMAX’s customized theatre geometry and powerful digital audio, create a unique environment that will make audiences feel as if they are in the movie. Company can be found at www.imax.com. You may also connect with IMAX on Facebook (www.facebook.com/imax), Twitter (www.twitter.com/imax) and YouTube (www.youtube.com/imaxmovies). Social Network), Diane Lane (Unfaithful), and Laurence Fishburne (What’s Love Got to Do with It); Oscar winners Jeremy Irons (Reversal of Fortune) and Holly Hunter (The Piano); and Gal Gadot as Wonder Woman/Diana Prince. Warner Bros. Pictures presents, an Atlas Entertainment/Cruel and Unusual production, a Zack Snyder film, Batman v Superman: Dawn of Justice. The film is distributed worldwide by Warner Bros. Pictures, a Warner Bros. Entertainment Company.